Bundesstadion Südstadt also known as the BSFZ Arena for reasons of sponsorship, is a multi-purpose football stadium located in the East Austrian town of Maria Enzersdorf. Home to FC Admira Wacker Mödling, the 12,000 capacity ground first opened in 1967 and is primarily used for football matches. 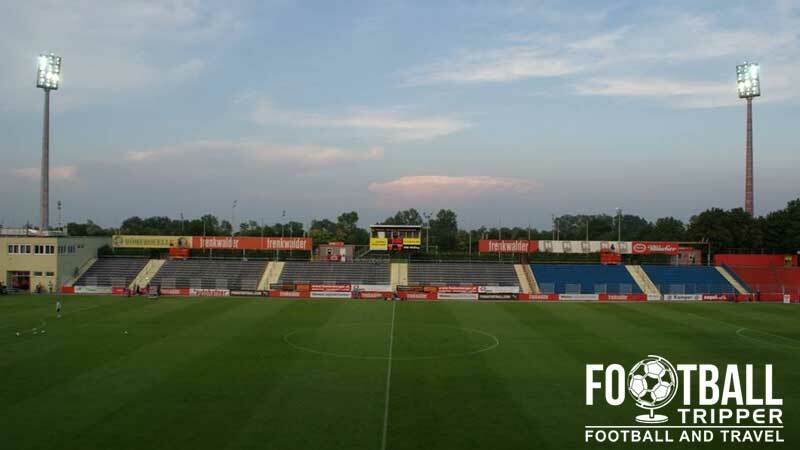 Built over a period of two years between 1965-1967, The Bundesstadion Südstad saw Admira Wacker relocate from the north of Vienna to south of the Maria Enzersdorf in the state of Lower Austria following the merger of of the club with SK Admira Wien. The inaugural Championship match was held against FC Wacker Innsbruck with the home team winning 3-1. The new ground proved to be a successful springboard for the newly merged club with the team managing to make the UEFA Cup knockout stages in 1973 after winning their fourth domestic title. Against all odds, the club managed to defeat Inter Milan, on the away goals rule with the plucky underdogs pulling off a remarkable 1 nil victory at the Bundesstadion followed by a narrow 2-1 defeat at the Giuseppe Meazza. Whilst they lost to Fortuna Dusseldorf in the next round, beating the Italian giants is seen as one of the club’s most iconic moments, on par with the regular appearances in the European Cup Winners Cup in the late 1980s and early 1990s. 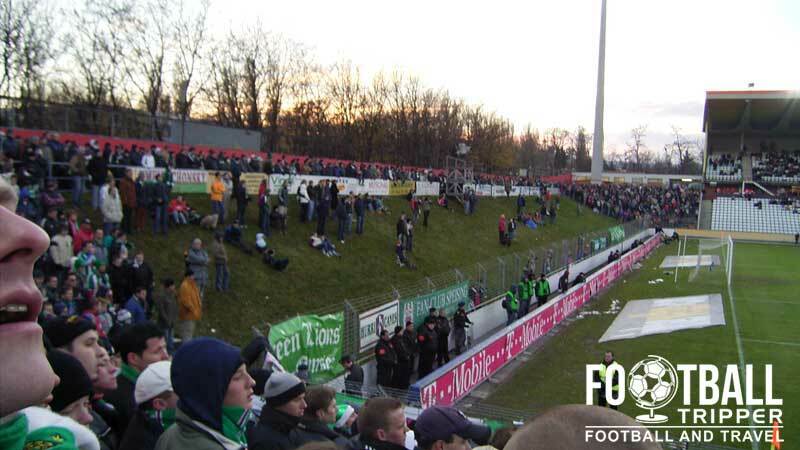 In 2008, the Bundesstadion received the addition of state of the art floodlights and a new television scoreboard display which were both partially funded by the agreement to sell the name to sponsors, a precedent which is continued today. 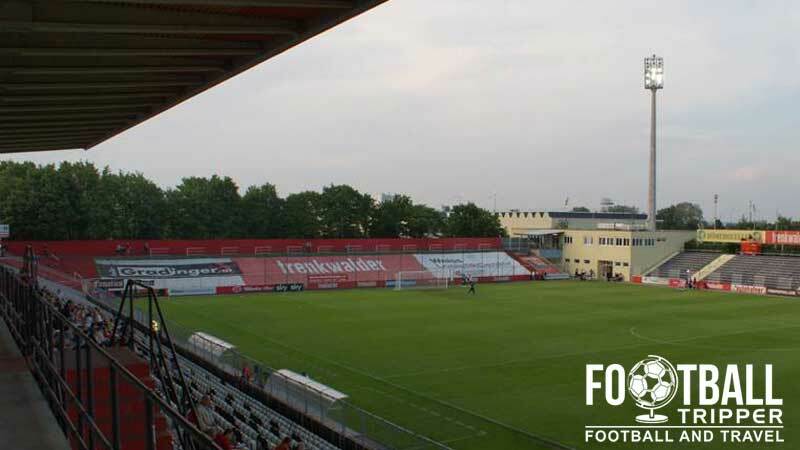 Initially known as the Trenkwalder Arena, it is currently known as the BSFZ Arena. Most recently renovations have occurred in 2013 when the club agreed with the state funded Federal Sports Centre a financial arrangement which saw three parties pay equal thirds for the new facilities. Currently the plan is to construct a new grandstand on the Northern perimeter of the pitch. This would replace the famous mound of grass which some fans currently elect to watch the game from. 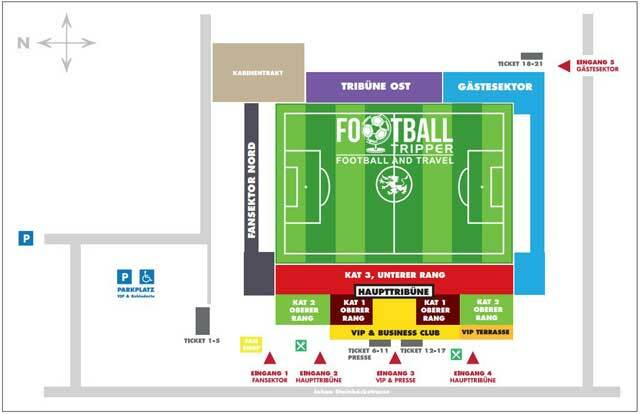 Bundesstadion is comprised of the four stands: North, East, South and West. Away fans either have the option of seating within the East Stand which runs for the length of the pitch or sitting/standing in south stand which is essentially just a grass berm and a platform at the top! Unsurprisingly most visiting supporters tend to avoid the grass where possible – especially in the winter months! Admira Wacker operate a fan shop at the stadium along Johann Steinböckstraße in addition their own online store which is built into the main site. It doesn’t appear as if tours of the Bundesstadion Südstadt are currently available. 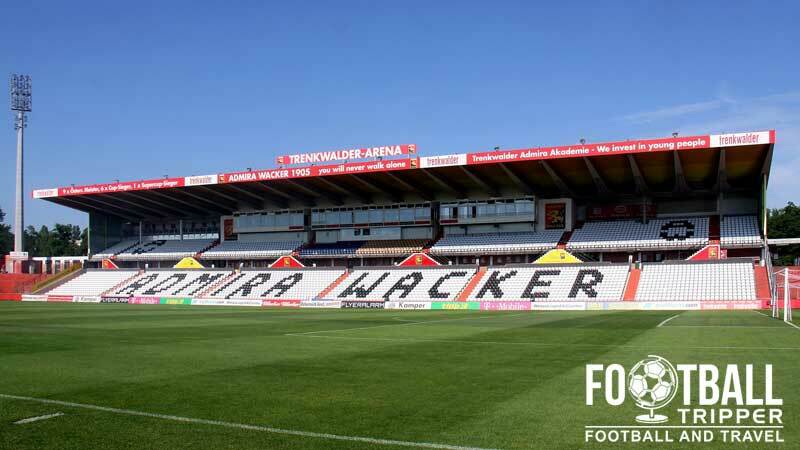 Tickets to see Admira Wacker play at home can be purchased via the usual channels: Online (print at home and save €1.00), fan shop/club office (as per the aforementioned opening hours) and from the stadium’s box office (10.00 am until kick-off on matchdays). Please note that the above prices are merely illustrative and aren’t reflective of every possible match and opponent. BSFZ-Arena is situated out of town approximately 16 km south-west of Vienna city centre within the area of Maria Enzersdorf. Highly impractical to walk to from the city centre, most Football Trippers instead make us of Vienna’s excellent public transport infrastructure. According to Admira Wacker’s website there is ample parking available at BSFZ-Arena and the wider sports complex on matchdays. The closest railway station is “Bahnhof Mödling” at a distance of 2.2 km resulting in a walk of around 20-25 minutes. From Modling Train Station you can catch buses 262 and 265 to pretty much outside the stadium. Vienna International Airport is located less than 20km south-east , and is connected to the city’s main railway station via the U-Bahn metro system. Back towards Modling Station there is the Phoenix7 and City-Hotel Mödling hotels however these represent the only real accommodation options within the Maria Enzersdorf area where BSFZ-Arena is located. Once you’ve caught the overground back to Vienna’s central station numerous places to stay become available including familiar names such as Hotel Ibis, Best Western and Ramada Inn.